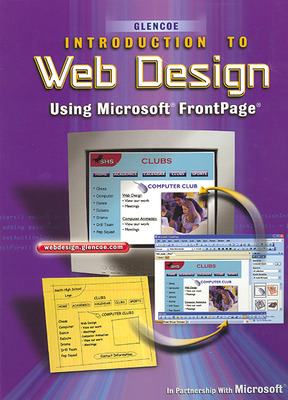 Glencoe’s Introduction to Web Design Using Microsoft FrontPage provides students with step-by-step activities that teach the skills needed to plan and create Web sites. The text explains the core principles of good Web design and illustrates how to develop sites that are informative, visually appealing, and easy to navigate. Glencoe’s Introduction to Web Design Using Microsoft FrontPage provides students with step-by-step activities that teach the skills needed to plan and create Web sites. The text explains the core principles of good Web design and illustrates how to develop sites that are informative, visually appealing, and easy to navigate. Easy-to-follow exercises teach students the basic skills needed to use Microsoft FrontPage, a popular Web site development software application. Standards-aligned activities, projects, and cross-curricular exercises provide practice and reinforcement throughout the text. Reading guides and strategies help students comprehend conceptual information and technical skills. Feature articles provide additional information about important topics such as career opportunities in Web design and the ethics of using technology. Portfolio projects and 21st Century Skills activities provide students with opportunities to understand how skills learned in the classroom are used in the real world. Integration of core academics, where appropriate, reinforces state and national standards. The program also includes a Teacher’s Resource Manual that provides targeted professional development resources, course planning resources, lesson plans, scope-and-sequence outlines, grading rubrics, and assessments. The Teacher’s Resource Manual includes a CD-ROM that features study guides, example projects, student templates, additional activities, PowerPoint presentations, and ExamView testbanks. The book’s comprehensive Web Site includes additional student projects, interactive activities, self-assessments, support files, and resource links.